Legend holds that the goddess Hera, in tribute to her trusted servant Argus upon his death, preserved his all-seeing eyes by casting them upon the feathers of the peacock. To this day, the peacock is said to be a symbol of protection and fidelity. 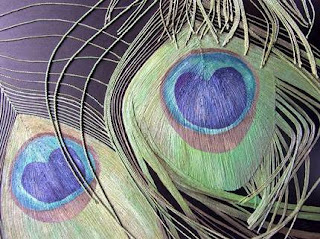 Today, a look at a beautiful array of objects that draw inspiration from the stunning beauty of the proud peacock's feathers. First, is a beautiful photograph of the eye of the feather. 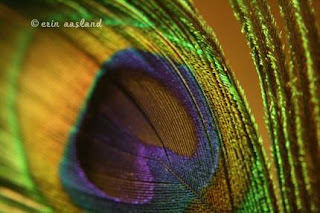 This photo beautifully highlights the shimmer and opalescence of the peacock's stunning plumage. This photograph is by erinaasland. Next, is this truly inspired piece cathysavelspaintings. This is an intricate and dimensional piece which beautifully captures the essence of the feathers. Click the photo to go to the listing for a full explanation of how this piece was created. Personally, I find the detail work to be staggering. 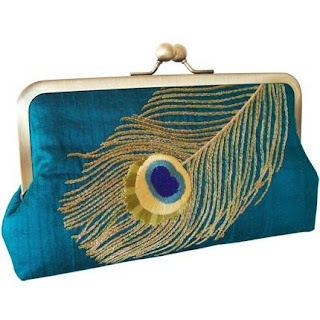 This absolutely lovely clutch is made from a breathtaking peacock teal silk. It has been deftly hand-embroidered with a peacock feather motif. You can find this in the shop of ClutchThat. 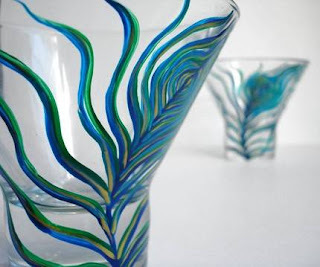 Stemless martini glasses have been given a decorative touch with the addition of handpainted feathers. These glasses are found in the shop marywibis. 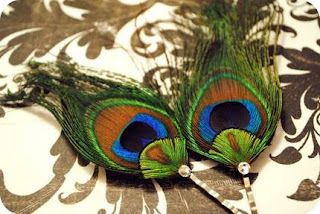 And finally, an eyecatching pair of peacock feather hairpins. These come to us from the shop (fittingly named) prettypeacockshop. You can easily forgive a peacock its pride when you witness this beauty, can't you. What a delight to find my Peacock Feather Clutch featured on your wonderful blog! So many beautiful things here. I'm honored to be in such company. Thank you! Many welcomes, Rosemary! You have a beautiful shop.